Our bus is now negotiating the road between “Aihole” and “Pattadakal.” This road also can not be considered as comfortable for travel. The road, in the first place is very narrow and full of pot holes. On both sides of the road, I can see standing crops of sugar cane almost ripe for cutting. That explains the almost continuous traffic of huge trailers carrying tons of sugar cane, being pulled by tractors to some sugar factory around. To add to our woes on road, are the number of cattle herds being driven to some nearby grazing spot and also hot blazing sun. 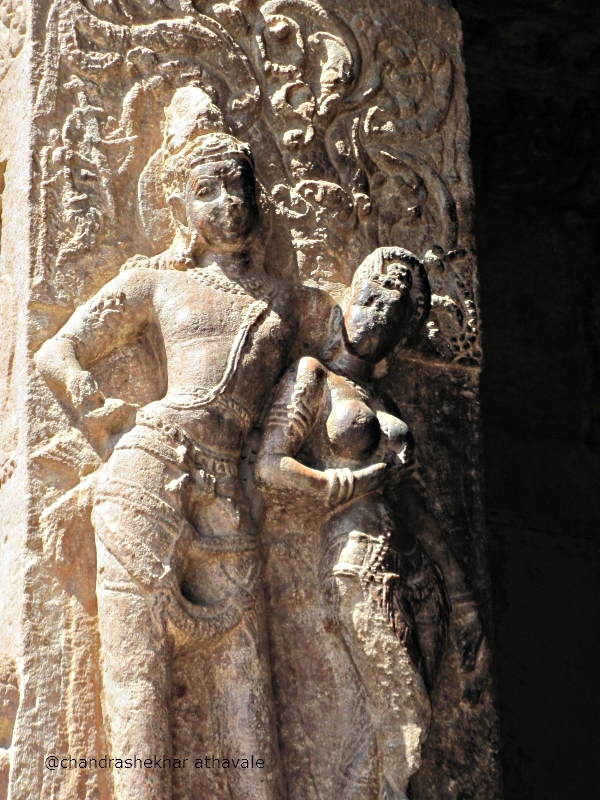 Many travellers like me, bear with all this happily, for one and only one reason, the expectant joy of visiting something that is considered as one of the best in the world, the fabulous architecture of “Pattadakal” temples. 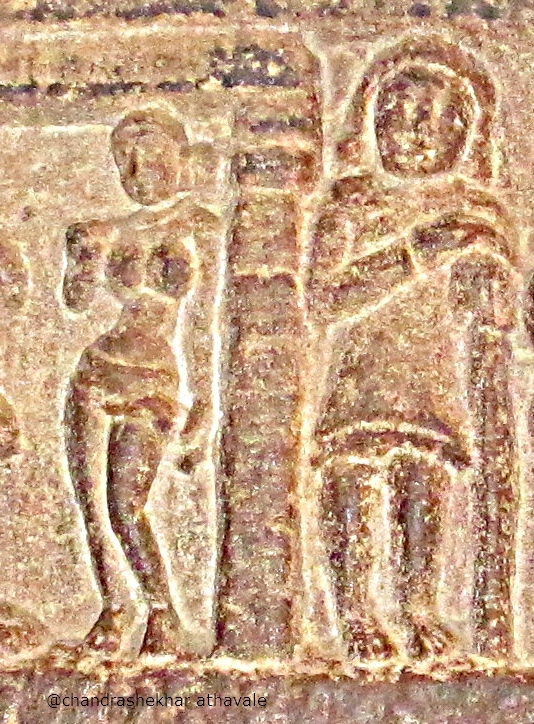 These temples are compared by many to solid gold, a standard with which other temples may be judged. 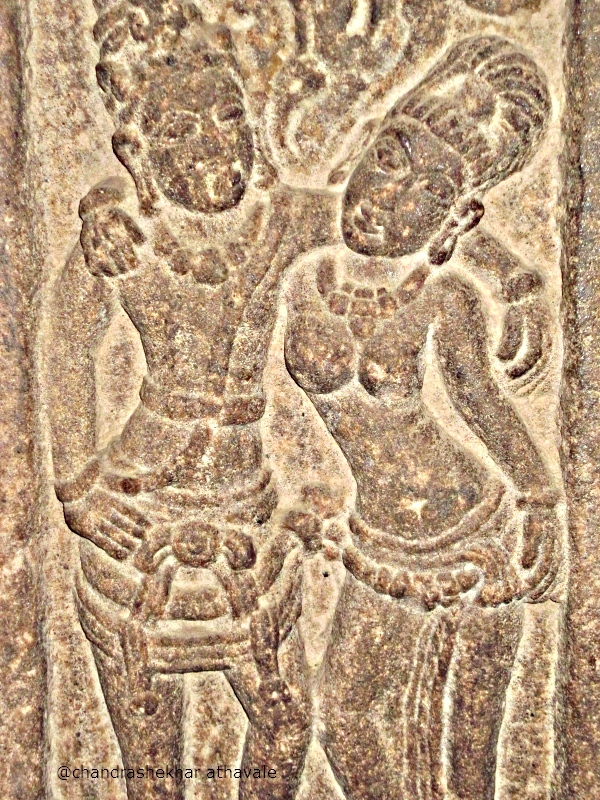 They say here that if “Aihole” temples are considered as artifacts created by kids studying in primary school, then “Badami” rock cut temples would have to be considered as artwork done by middle school boys and without any doubt, “Pattadakal” temples could be only considered as art forms created by university students. Our bus stops next to the “Pattadakal” archeological complex. The entire area has been well secured and protected with chain link and barbed wire barricades. I buy entry tickets for me and my camera and enter the complex premises. The first view is rather impressive. 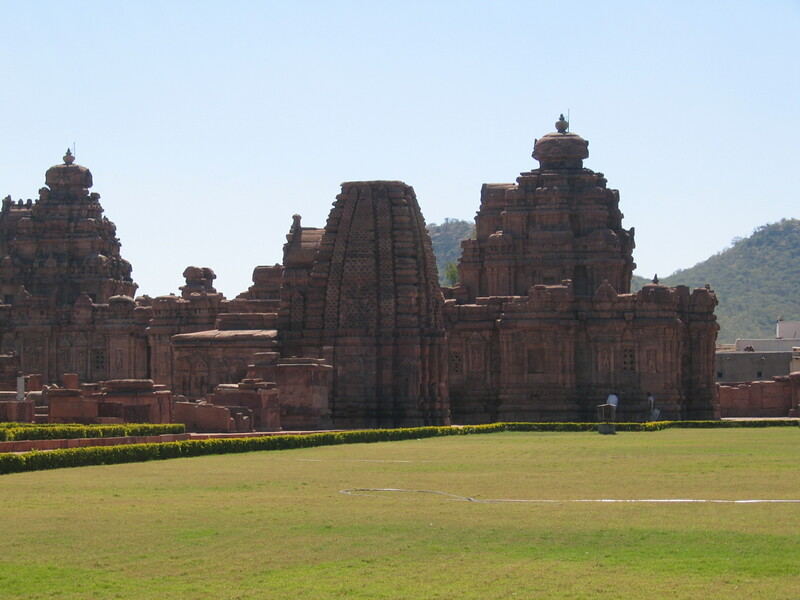 In front of me are large tracts of well manicured green grass lawns, glistening in the mid noon sun and behind the grasses are the stunningly beautiful temple structures of Pattadakal. 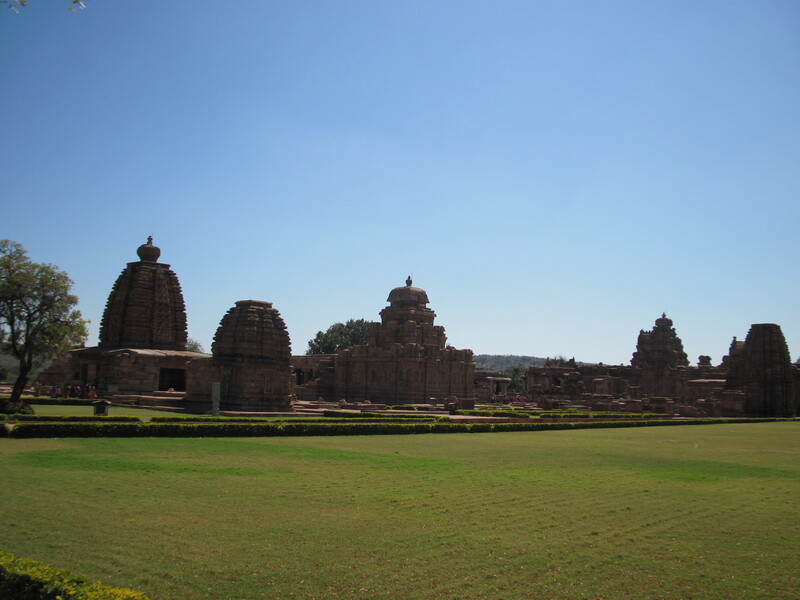 These temples were built in seventh and eighth century CE and, when compared to “Aihole,” the over all plan and workmanship appears to be far superior. 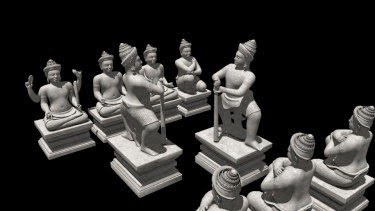 I cross the greens along the well marked walkways and enter the temple premises from the northern gateway to come across the first two temples of “Kadasiddheshwara” and “Jambulingam.”which in reality, are two forms of same deity; Shiva. 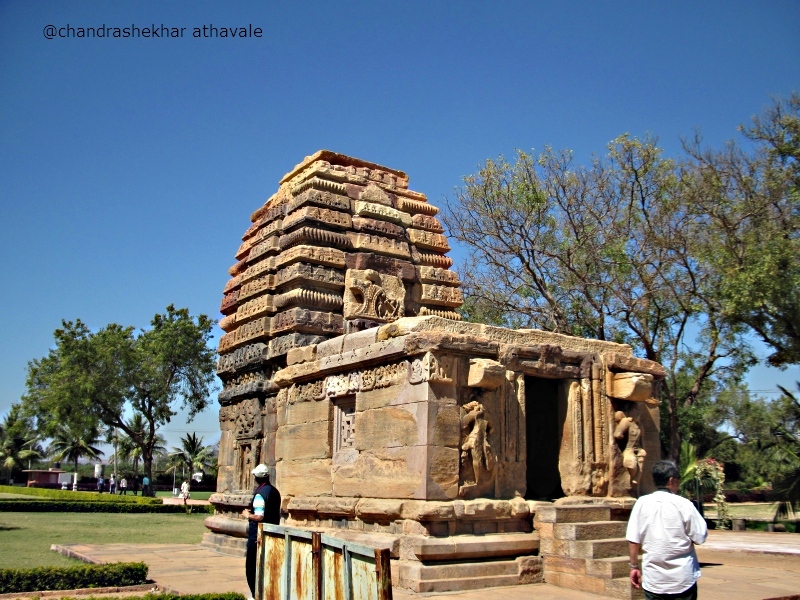 For both temples, the towers above are similar to the Sun God temple at “Aihole,” and are of curvilinear pattern ( North Indian style) and the construction appears simple , straight forward and somewhat similar to each other. 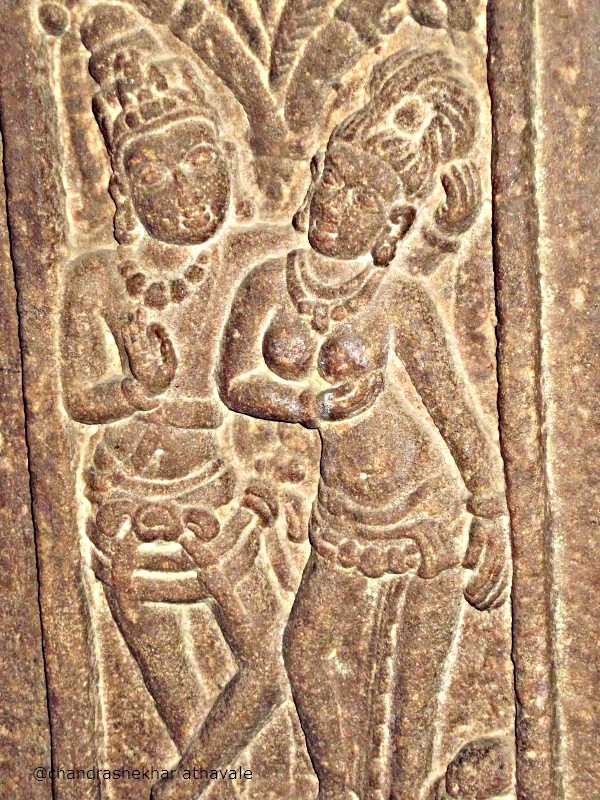 On the eastern wall of “Kadasiddheshwara” temple there are high reliefs of two standing doorkeepers, whereas in the other or “ Jambulingam” temple, the wall stand plain and simple. 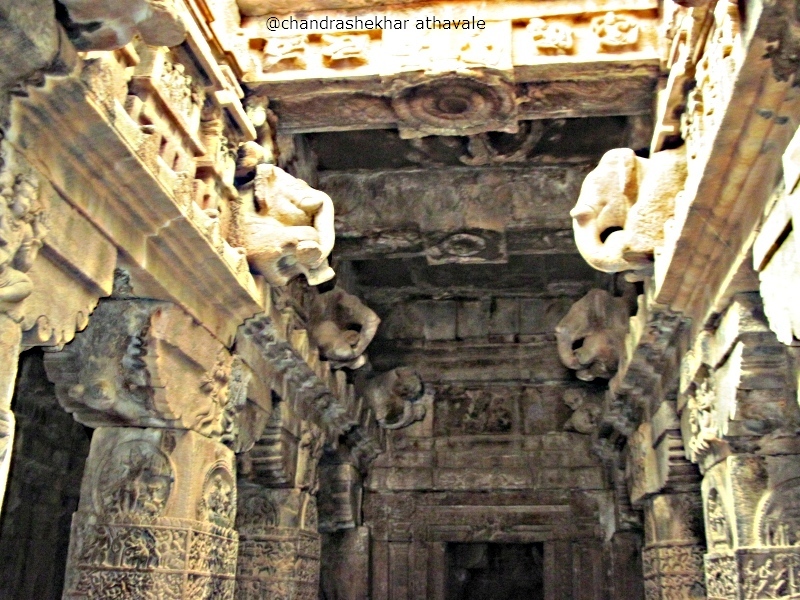 “Pattadakal” temple architects were keen to try out new techniques and experimented continuously with newer forms. 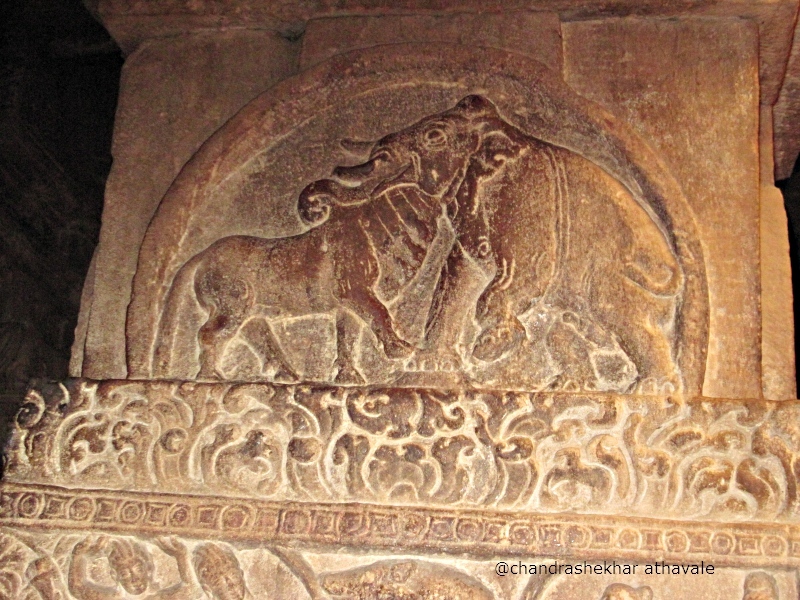 In both these temples, the curvilinear towers bear a bass relief sculpture on the front side, which was something new. 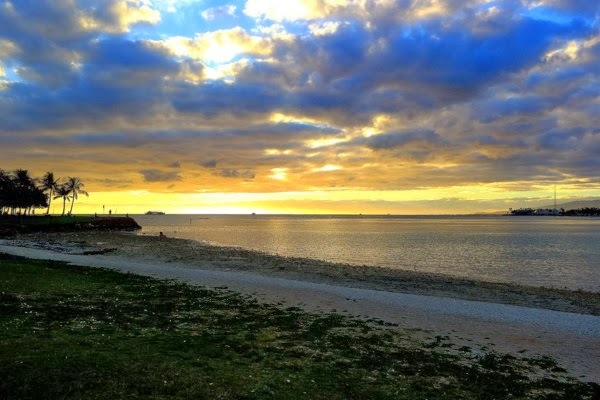 I continue walking. 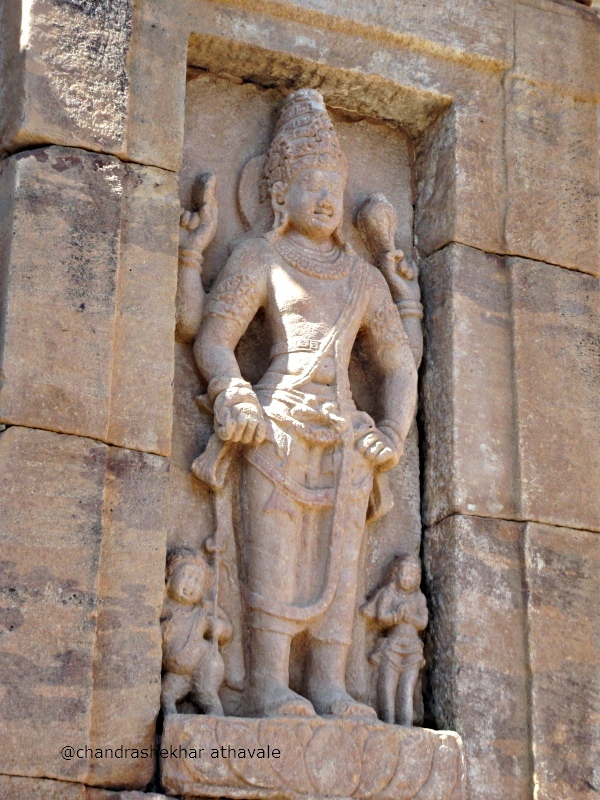 The next temple is known as “Galagnath” temple. The temple tower is also curvilinear but here there is a new change in design. On both sides of the temple, two verandas have been added, which appear to me like two wings. The verandas have sloping stone slab roofs. 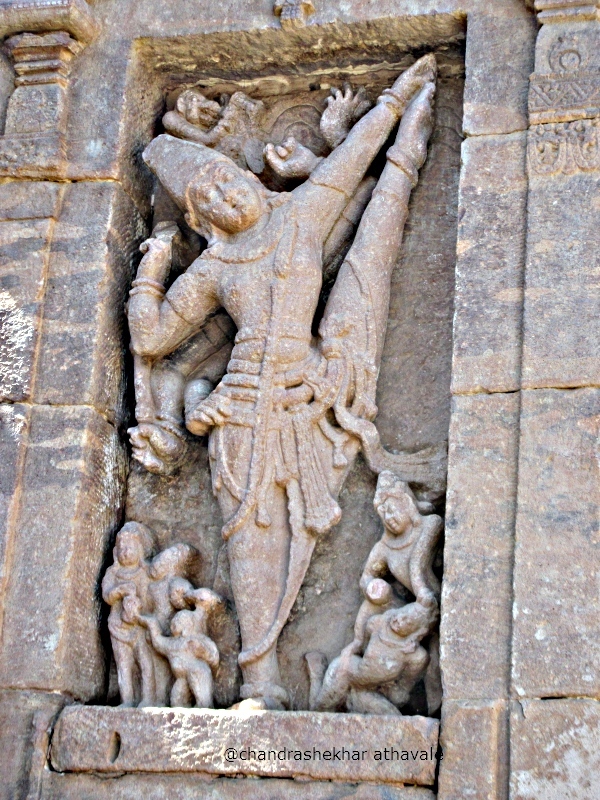 The front door lintel has a bass relief showing Shiva doing his “Tandava” or doomsday dance along with small figures of “Parvati” and “Nandi.” The next temple is the “Sangameshwar” temple. 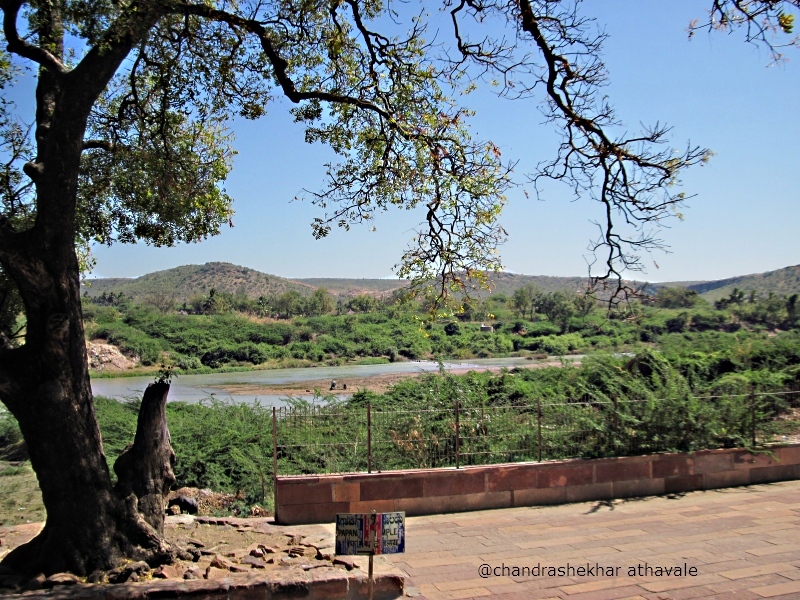 In the year 2009, there were huge floods in the “Malaprabha” river and entire “Pattadakal” village had gone underwater. 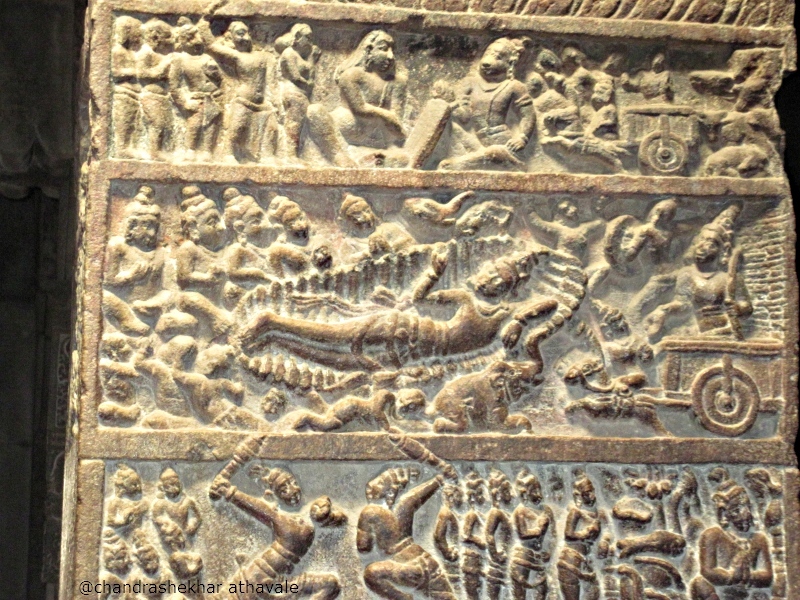 Many of the villagers had then taken refuge on the roof of this temple. 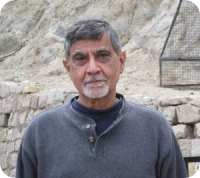 This temple is quite specious and appears to have rock solid construction. 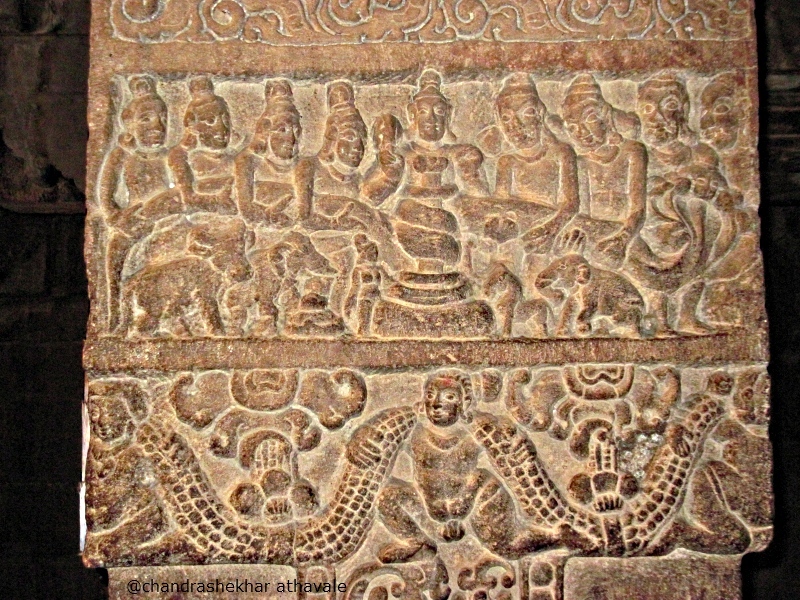 I am not able to see much of decorations here on the roof but the walls have nice lattice work windows cut in stone and some relief sculptures but of smaller size. 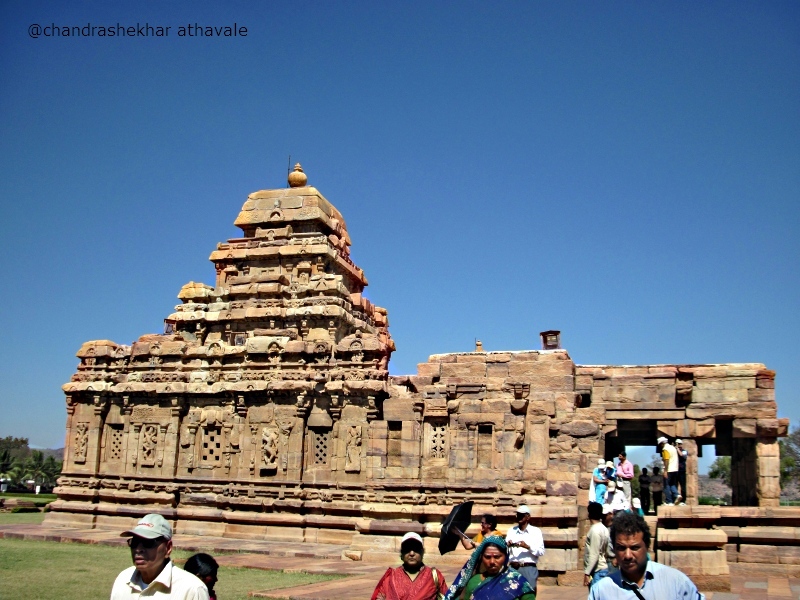 The next temple ahead is “Pattadakal's” biggest and most famous temple of “Virupaksha.” This was constructed by queen “Lokamahadevi” pf Chalukya king “Vikramaditya II.” This temple was constructed as a mark of the famous victory won by this king over his arch-rival, “Pallava” king at “Kanchipuram.” The outer walls of the temple have some superb high relief sculptures, which not only include Gods and Goddesses like Shiva-Parvati, but also portray other subjects like all time favourites; couples in love and also an ascetic doing yoga. 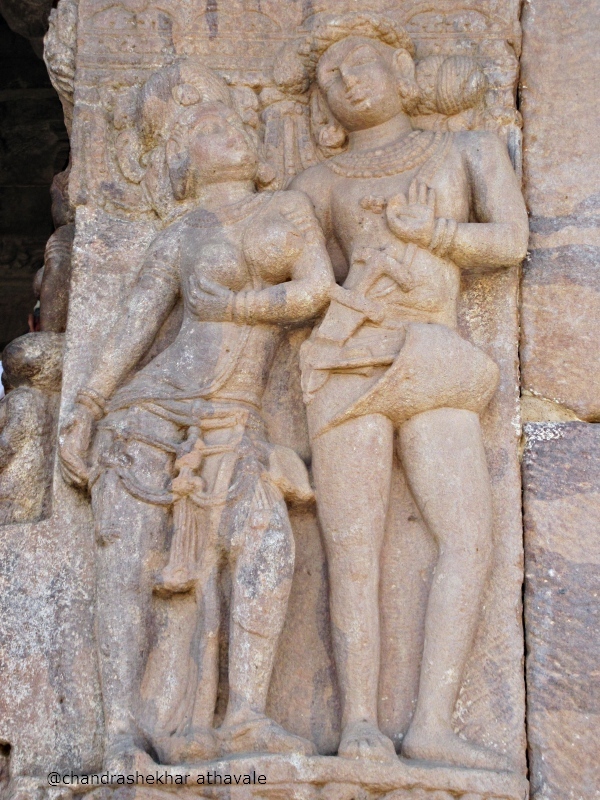 The 'couples in love' sculptures here appear to me somewhat of different style. Along with couples embracing each other, I can also see a couple here, where the lady is questioning or ordering her man. 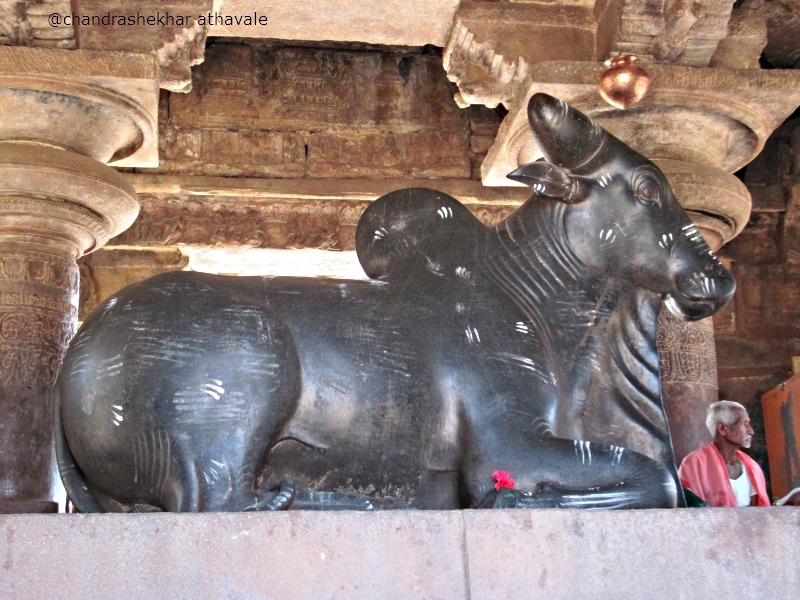 Facing the main entry door to the temple a huge black coloured “nandi” or the bull, sits waiting for the command of his master, the God “ Virupaksha.” Behind this bull is the river bed of “Malaprabha.” This temple is quite impressive and shall always remain etched in my memory. I enter in the main prayer hall of the temple. 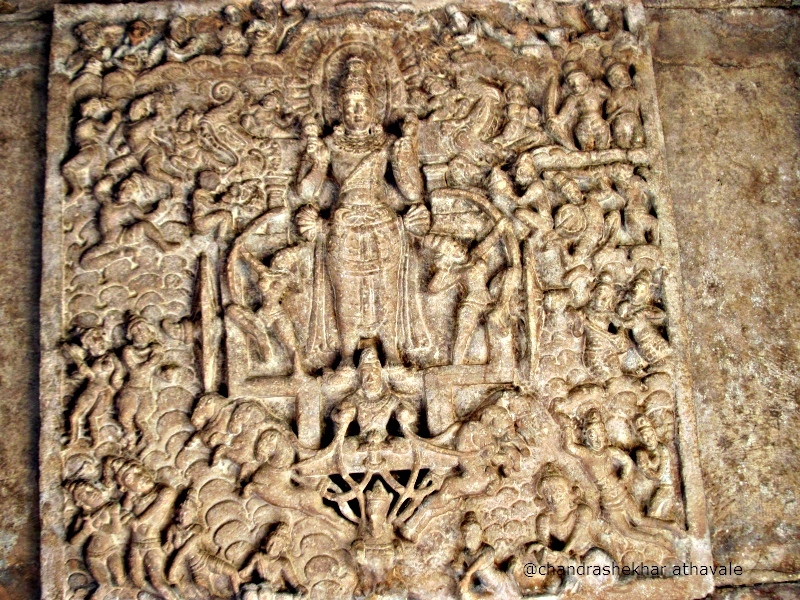 Up above on the roof is a fabulous bass relief of the Sun God riding in his chariot of 7 horses representing 7 days of the week. 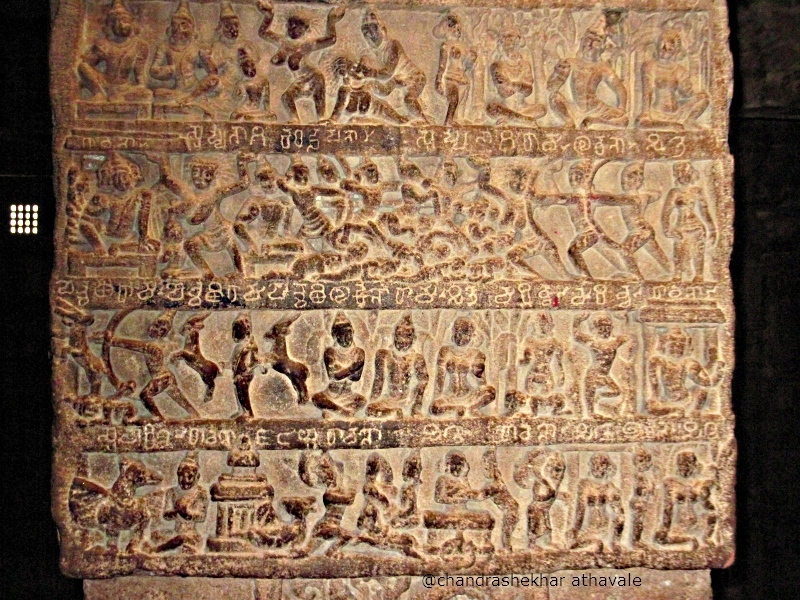 All the pillars in this hall have small panels of miniature bass reliefs depicting stories from Ramayana, mahabharata and Bhagavata; important Hindu scriptures. 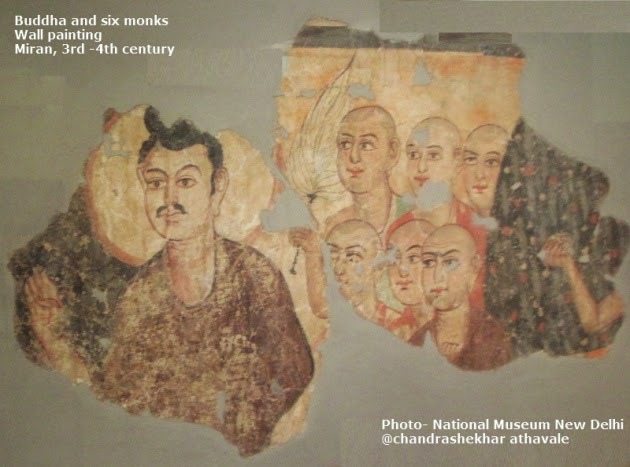 To observe and study all sculptures here, one would need to spend at least few weeks here. 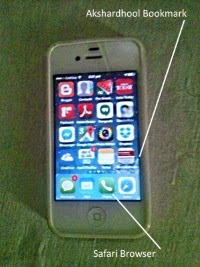 Since I do not have that kind of time available, I continue to move. 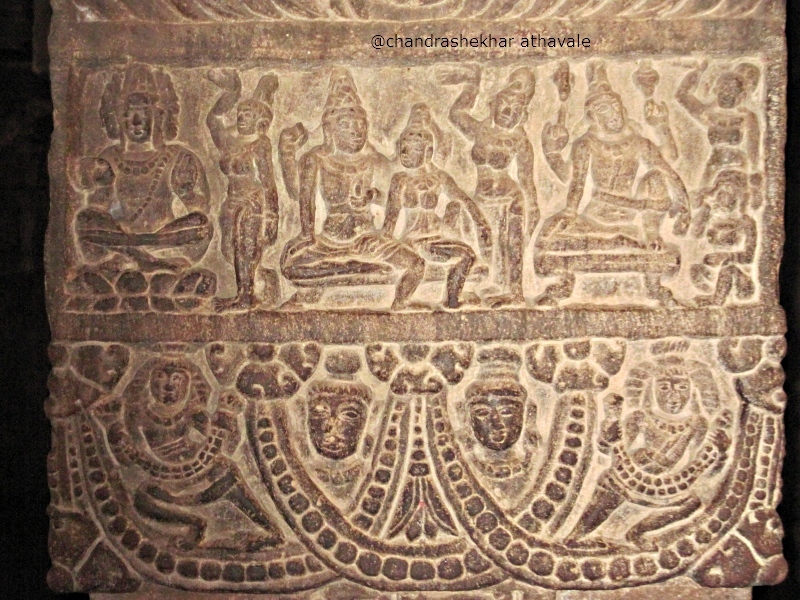 Just on the side of “Virupaksha” temple, there is a similar temple, which was constructed by “Trailokyamahadevi,” the second wife of king “Vikramaditya II,” who incidentally was the younger sister of “Lokamahadevi.” This temple is known as “Mallikarjun” temple. 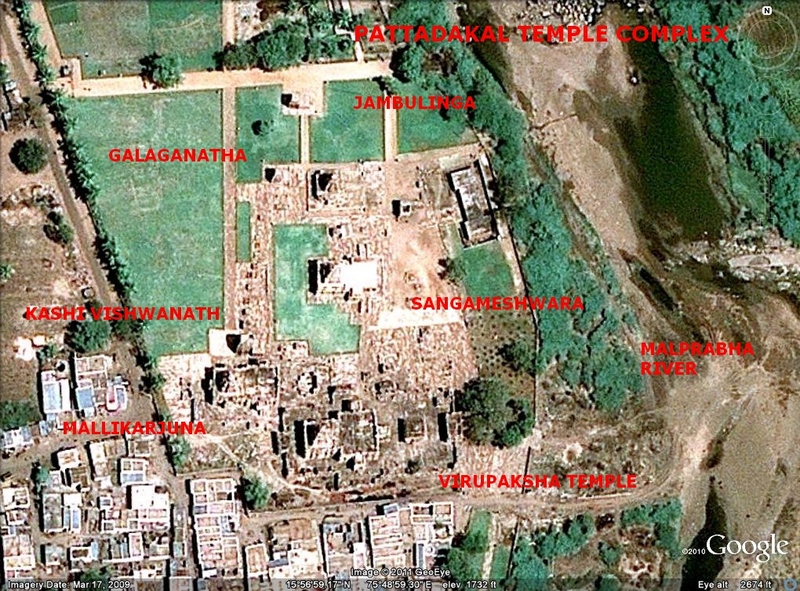 The overall layout of this temple is very similar to “Virupaksha” temple. 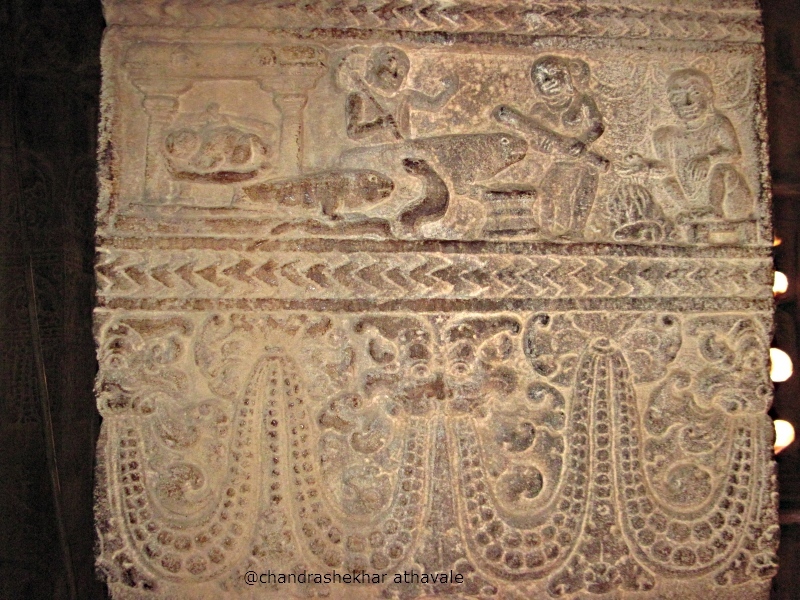 The difference is in the subjects chosen for the bass reliefs in side the temple hall, which are mostly from stories narrated in books like “Panchatantra,” and “puranas.” “Panchatantra” carries animal stories just like Aesop's fables. 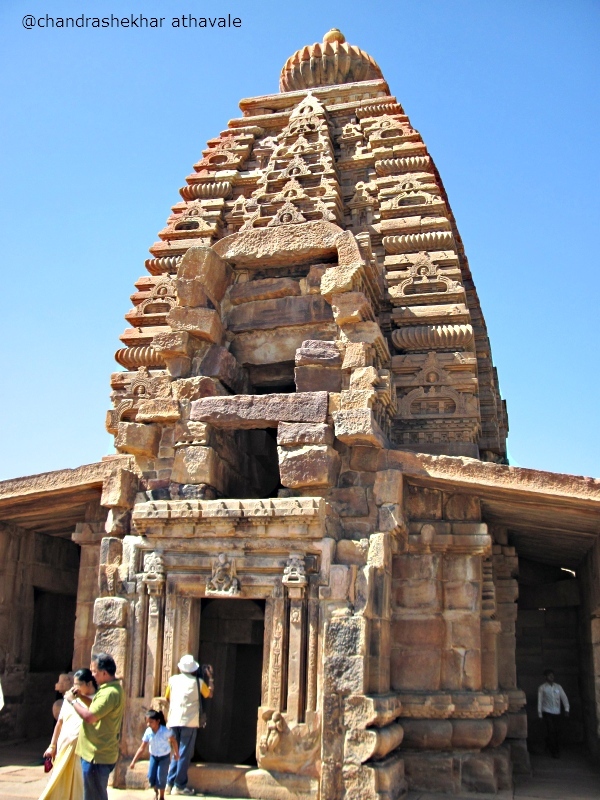 Both “Virupaksha” and “Mallikarjun” temples have towers of typical south Indian style and look quite different from other temples having north Indian curvilinear towers. 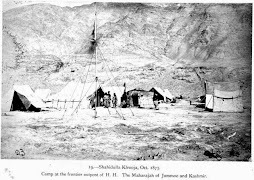 The temple adjacent to “Mallikarjun” temple is known as “Kashi Vishveshwar” temple. In all the temples that I saw so far, the presiding deity was Shiva. This temple is also no different. The presiding deity here is also none other but Shiva. 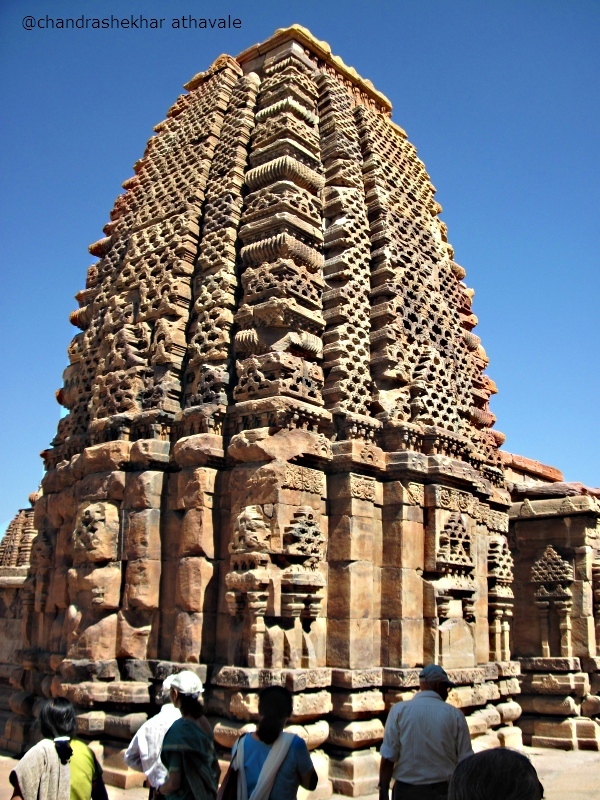 This temple has north Indian curvilinear style tower, yet the intricate design on the tower appears quite different and is making this temple to stand out. 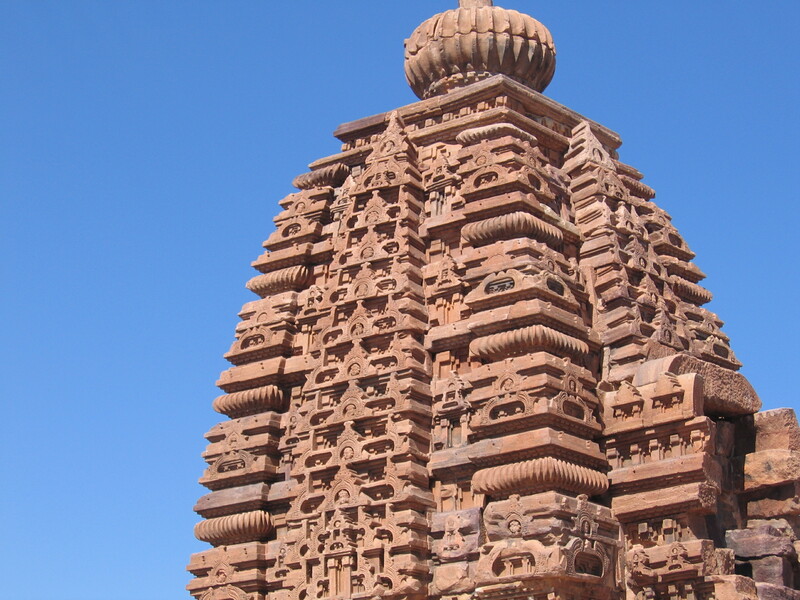 In the history of temple Architecture of India, “Pattadakal” temple architecture is considered as a major milestone. 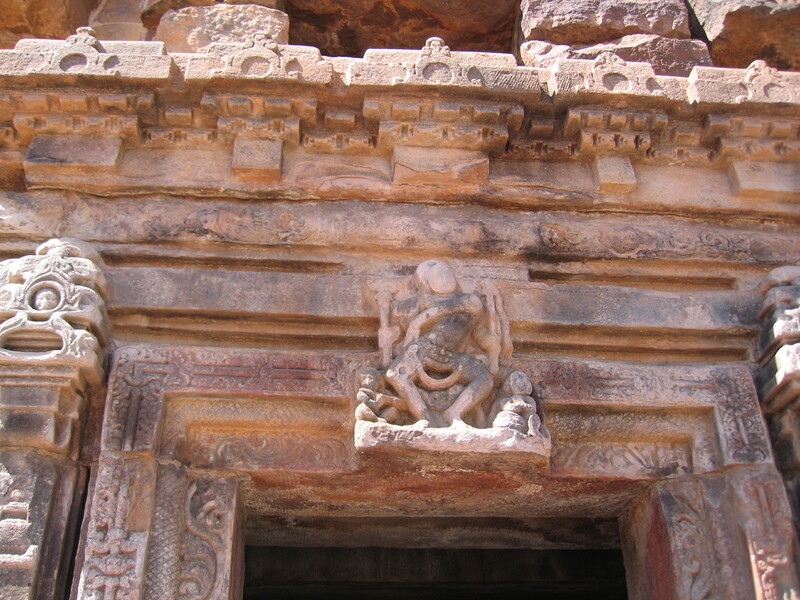 Experts say that in “Pattadakal” one can find a eye pleasing combination of north and south Indian styles of architecture. Frankly I am no expert in this line and can not really add anything worthwhile. 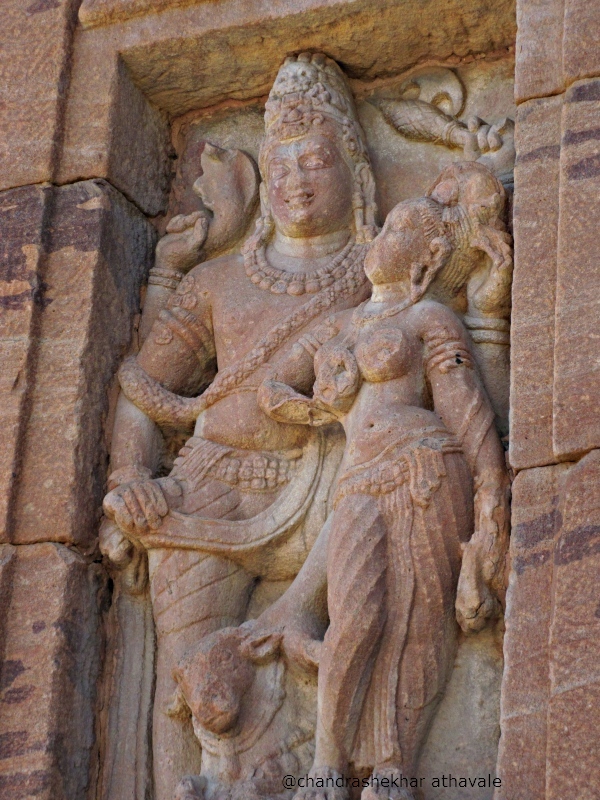 As a layman, I am comparing the temples and sculptures of “Aihole” and those that are here. The temple architecture here is far superior, no doubt on that. 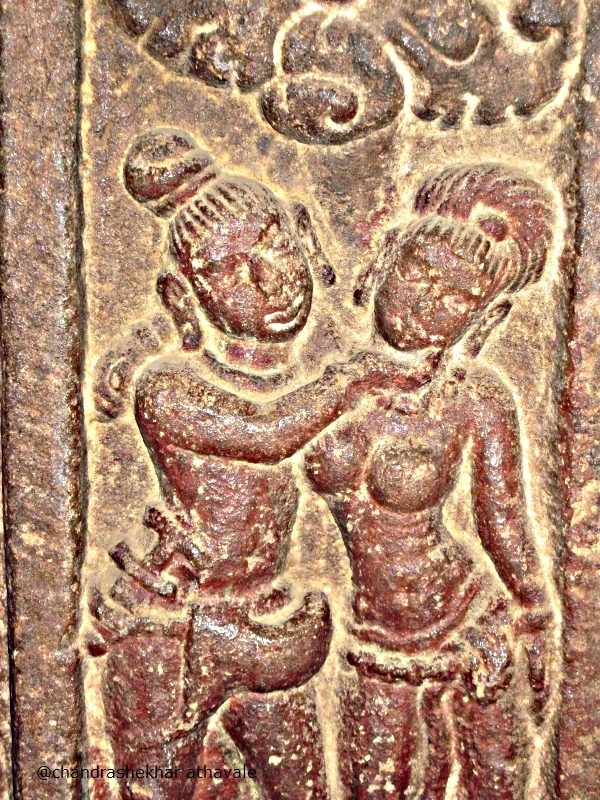 I somehow prefer the high reliefs of “Aihole” which appear more lively and lifelike. The relief sculptures here are many more, have much varied subjects, yet do not appear that live, at least to me.